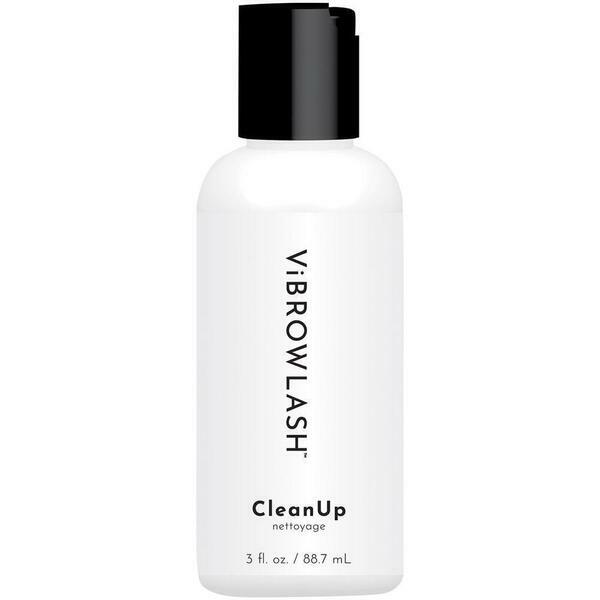 Vibrowlash Clean Up 3 fl. oz. - 88.7 mL. Vibrowlash Clean Up / 3 fl. oz. - 88.7 mL. Instantly remove ViBrowLash Color Cream from your hands or hard non-porous surfaces with ViBrowLash CleanUp. Not for use on or around the eyes. For professional use only. Made in the USA. Free of gluten and lanolin. Vegan Awareness certified. Leaping Bunny certified. Size: 3 fl. oz. / 88.7 mL. This product should not be used on the face. It should never be used on the client. Do not get product into the eyes. 3 fl. oz. / 88.7 mL. Water/Aqua/Eau, Isopropyl Alcohol, Cocamidopropyl Betaine, Fragrance (Parfum). If you are opening a new ViBrowLash product, write the date the product is opened on the outside of the packaging with a Sharpie marker or pen. The product should be disposed of 3 to 6 months from the date written on the product packaging, depending on the product. Temperature fluctuation can cause settlement of the developer solution, but this has no negative effect on the quality of the product. It is best practice to shake the activator solution prior to use. The color of the mixture is not the color that the hair will be once it has processed. To get an idea of the final color, leave a wooden applicator in the mixture for the desired time. Occasionally, you may notice oxidation of the ViBrowLash Color Cream near the cap. If this occurs, squeeze out the oxidized portion of the product and discard it. Using oxidized ViBrowLash Color Cream could cause undesired color results. You should stay with your client during the time that their eyes are closed to make sure that they are comfortable during the tint processing time. If the client wears contacts, it is recommended that they remove them prior to the service. It is not recommended that you perform the ViBrowLash service on a client who has already had a negative reaction to similar products like hair color. If the client is also booking a facial or eyebrow waxing service, then the client should be waxed after the ViBrowLash service. If the client is also booking a lash extension and/or brow extension service, then the ViBrowLash service should be administered before the extension service(s). If the client is also booking a lash lift or perming service, then the client should receive the ViBrowLash service after the lift or perm is administered. It is recommended that clients wait 2 full weeks after receiving filler or Botox treatments before having the ViBrowLash service administered. Regarding chemical peels, it is recommended to refer to the manufacturer’s protocol and suggested aftercare instructions when determining if it is appropriate to administer the ViBrowLash service. For example, if the peel protocol states that the client should wait 24 hours before wetting the face, then the VibrowLash service should not be administered for 24 hours after the peel service. If a reaction occurs during the patch test, such as intense stinging, irritation, rash, or a burning sensation on the skin, rinse the skin immediately and discontinue use. If client experiences mild respiratory irritation, he or she should seek immediate medical attention, and the client should consult a physician prior to having the service again. If, during the days following the patch test, itching, redness, or spots on the skin occurs, or swelling of the eyes, face, or skin occurs, it is recommended that the client consult a physician. Give your client a few moments to adjust to the eye pads and ensure the eye protection pads are not so close to the client’s eyes that they cause the eyes to water. The ViBrowLash mixture should be applied in a professional manner, with care and precision. There is no reason for this to be a messy service. If the ViBrowLash product accidentally gets into the eyes, take your client to an eyewash station and flush eyes with plain water immediately! If you do not have an eyewash station, flush the eye with saline solution, warm water, or eye wash and pat dry. The client should not rub their eyes as it might cause further irritation. If no irritation occurs, you may reapply the product immediately. If any ViBrowLash product accidentally gets on to the face, remove it as soon as possible with warm soap and water. Do not use ViBrowLash Clean Up directly on the lashes, eyelids, or eye area. As the product develops, it may expand and migrate beyond the desired area of the eyelashes and onto the lids or eye area. As this occurs, you may wipe the expanded product off the skin using a cotton swab, cotton round, or esthetic wipe. Remove the excess product around the eye area to prevent discoloration or temporary staining of the skin. After all of the ViBrowLash product has been removed from your client’s lashes offer a round cotton pad dampened with water and a dry cotton pad so the client can wipe their eyes for additional comfort. If you get ViBrowLash Color Cream on your hands while mixing, use a cotton ball dampened with ViBrowLash Clean Up to remove the tint. Wash your hands with soap and water immediately. BEFORE APPLYING THIS PRODUCT, YOU MUST PERFORM A SENSITIVITY TEST. This product contains ingredients that may cause skin irritation on certain individuals and a preliminary test should be made first according to accompanying directions. Using a 1:1 ratio, mix the Vibrowlash Color Cream with the Vibrowlash Activator and place 2 small dabs on the inner arm, just above the elbow. Wait 2 minutes, and then gently wipe off with a dry cloth. Wait 24 to 48 hours. If no irritation or inflammation is apparent, it is usually assumed that no hypersensitivity to the product exists. The test must be carried out before each application. If there is any redness or irritation, DO NOT OFFER THE TREATMENT TO THE CLIENT, AND PUT HER/HIM IN YOUR RECORDS AS BEING SENSITIVE AND NOT ALLOWED TO RECEIVE IT. Drape client appropriately for lash and brow color service. If your client is wearing contact lenses, ask if he or she would like to remove them prior to the service. Client should be sitting upright with head slightly tilted back. DO NOT fully recline the client's head because this will increase the risk of color product getting into their eyes. Prepare for product application by cleansing the eye and/or brow area with Vibrowlash Oil-Free Makeup Remover. The lashes and/or brows should be completely dry and free of oil and makeup prior to the color service. Apply skin protectant to skin surrounding eye and for brow area(s) to avoid staining. Shake the Vibrowlash Activator before each use. Temperature fluctuation can cause settlement of the product but has no negative effect on the performance of the color. Always store this product in a cool place. Mix a 1:1 ratio of Vibrowlash Color Cream and Vibrowlash Activator and stir until the consistency is a creamy paste. The color of the mixture is not the color that the hair will be after processing. Begin color application(s), If applying color to both lash and brow areas, begin with lash application as detailed in Step 7. Apply color product to brows as described in Step 11 while client's eyes are completely closed, AFTER lash color has been applied. If applying color to brows only, you may skip to Step 11 now. To begin LASH COLOR application, place a protective eye pad under the lower lash area on top of the skin protectant. The skin protectant will prevent skin staining and will keep the protective pad in place during product application. Using the Vibrowlash Application Brush, mascara wand, or disposable lipstick brush, apply the Vibrowlash Color Cream mixture to lower lashes first on both eyes. As you begin lower lash application, instruct the client to look up. Make sure the activated Vibrowlash Color Cream covers lashes evenly from base to tip, including lashes at the corners of the eyes. When lower lashes for both eyes are completed, instruct the client to close his or her eyes until the application and removal process is complete. Apply Vibrowlash Color Cream mixture to upper lashes from base to tip. D0 NOT press color product into lash area during application. Use light, even strokes to cover lashes with the Vibrowlash Application Brush, mascara wand, or disposable lipstick brush. To begin BROW COLOR application, make sure the eyebrow hair is completely dry and free of oil and makeup. Apply skin protectant as needed. Instruct client to keep eyes closed until procedure is complete. Apply product to brow, but DO NOT press the activated Vibrowlash Color Cream into the skin and DO NOT apply product thick enough to drip. If Vibrowlash Color Cream accidently gets in the eyes, take your client to an eyewash station and flush eyes with plain water immediately! If you do not have an eyewash station, flush the eyes with saline solution or warm water and pat dry. DO NOT RUB EYES. If no irritation occurs, you may reapply the Color immediately. Eyes must be free of redness or irritation to proceed. If any Vibrowlash Color Cream gets on the face or in eye area, remove it with warm soap and water as soon as possible. DO NOT use the Vibrowlash Clean Up directly on facial skin, lashes, eyelids, or eye area. Processing time will differ depending on temperature fluctuation, the texture and coarseness of the client's hair, and the hair's original color. LASH processing time is 8-10 minutes. BROW processing time is 3 minutes. When processing is complete, remove protection pads from under lower lash area. While the client's eyes remain closed, remove color product with a downward motion. Use round cotton pads dampened with warm water and very light pressure. Hold tissue under lower lash and/or below brow to capture any excess moisture while gently removing color product with cotton pads. NOTE: Occasionally you may notice oxidation of the Vibrowlash Color Cream near the cap. If this occurs, squeeze out the oxidized portion of the Vibrowlash Color Cream and discard it. Using oxidized Vibrowlash Color Cream could cause undesired color results. Vibrowlash Dark Brown Color Cream - Certified Vegan and Cruelty-Free Lash & Brow Tint / 0.67 fl. oz. - 20 mL. Vibrowlash Graphite Color Cream - Certified Vegan and Cruelty-Free Lash & Brow Tint / 0.67 fl. oz. - 20 mL. Vibrowlash Blue Black Color Cream - Certified Vegan and Cruelty-Free Lash & Brow Tint / 0.67 fl. oz. - 20 mL. Vibrowlash Deep Black Color Cream - Certified Vegan and Cruelty-Free Lash & Brow Tint / 0.67 fl. oz. - 20 mL. Vibrowlash Auburn Color Cream - Certified Vegan and Cruelty-Free Lash & Brow Tint / 0.67 fl. oz. - 20 mL. Vibrowlash Blonde Color Cream - Certified Vegan and Cruelty-Free Lash & Brow Tint / 0.67 fl. oz. - 20 mL. Vibrowlash Medium Brown Color Cream - Certified Vegan and Cruelty-Free Lash & Brow Tint / 0.67 fl. oz. - 20 mL. Vibrowlash Color Cream Activator - Developer / 3 fl. oz. - 88.7 mL. Vibrowlash Oil Free Makeup Remover / 3.38 fl. oz. - 112.3 mL. Vibrowlash Oil Free Makeup Remover / 8 oz.